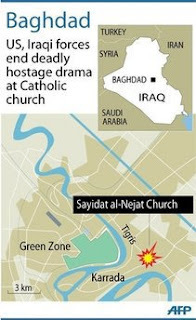 Sunday October 31, Catholics were celebrating mass at Our Lady of Salvation church in Iraq when al-Qaida gunmen stormed into the church and held the congregation hostage for four hours. 58 men, women, and children were murdered and 75 were severely wounded. Abdullah Hadad shared that she and her family were in mass when the shooting began, “We stood beside the wall and they started shooting at the young people. I asked them to kill me and let my grandson live, but they shot him dead and they shot me in the back. Some al-Qaida gunmen claimed they were defending themselves against the the plan by United States pastor, Terry Jones who had planned to burn the Qur’an on the anniversary of 9/11, but did not follow through with his plans due to opposition. Sunday evening, Raghada al-Wafi walked to mass bringing joyful news of her pregnancy to her priest who had just married her a month before. Raghada and her priest were killed just minutes after her unborn child in the womb was blessed by her priest. 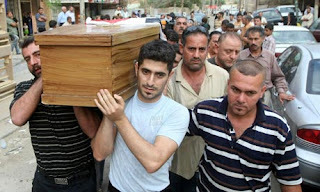 On Tuesday hundreds of Iraqi Christians attended a funeral service to morn the 58 lives that were lost during Sunday’s siege; while many families were morning their dead mortar and fire bombs hit some of the neighborhoods in Baghdad near by, with 13 confirmed attacks. 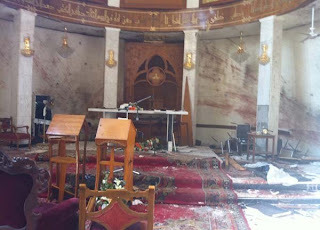 These second set of attacks caused the death of 76 people, and over 200 were wounded. “We were just standing on the street when we heard a loud noise, and then saw smoke and pieces of cars, falling from the sky,” said Hussein al-Saiedi. While the source of these attacks are not confirmed, information does lead to al-Quaida involvement. 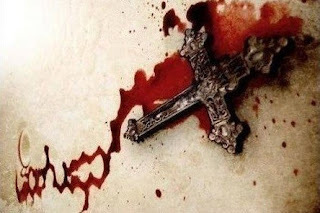 Please pray for the men, women, and children who were persecuted for their faith. Pray for protection of the Iraqi people. 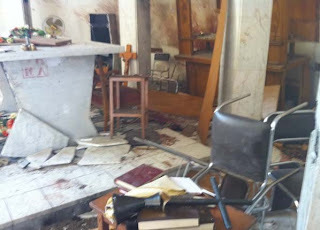 We are called to morn our Christians brothers and sisters who have died from these attacks. Encourage our United States government to help protect the Christians who are being persecuted for their Christian faith in Iraq, contact your United States Representative today. Send a Letter to Congress and President Obama!